Earth Science comes to life in this hilarious and informative show. 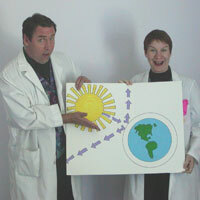 Leslie and Jay Cady of Laughing Matters use juggling balls as atoms and molecules to explain global warming, ozone depletion, and the carbon dioxide cycle. Audience volunteers help demonstrate the water cycle and the program concludes with a lively and humorous introduction to recycling. Fees: $375 single, $635 double / The break between performances must not exceed 90 minutes to receive the reduced rate. Title 1 Schools may qualify for funding assistance. Requirements: One 6' to 8' table. Teachers must be present at all times during performance.